This limited edition Rancor folder features a Damascus steel blade and checkered Cocobolo wood handles! Bear OPS (a division of Bear & Son Cutlery) created the MC-100 series knife for high demand users. 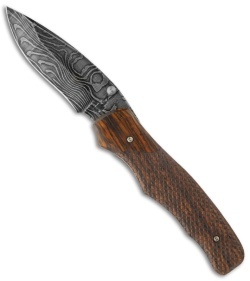 This model has a modified drop point style blade with a plain edge. 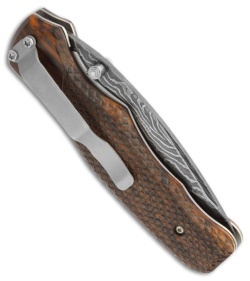 The handle measures 4-3/8" and features a steel liner lock frame. The tip-down pocket clip is bead blast finished to match the blade and frame. The action and overall quality is quite good.